I remember that in Ireland, it was very bad luck to see a single magpie on the roof of a house or outbuilding. Well, it was more than bad luck; it foretold a death. Some people believed the magpie was a bird with a drop of the devil’s blood under its tongue. Those beautiful birds with their irridescent feathers! A drop of the devil’s blood? Say it isn’t true! Magpies mate for life, like other corvids. So it’s a courtesy to extend a greeting to a single bird in the hope that he is not a widower or an outcast. (Often another bird flies up shortly after we say the greeting! Coincidence? Hmmmm.) And they are known to rob nests of other birds to feed themselves and their own offspring. Humans do that too. (One of my best childhood memories involves being asked to gather eggs on the farm where we were staying on Matsqui Prairie. I reached under the warm body of a hen for the egg that would become part of the batter for the breakfast pancakes…And think of roast lamb, veal, suckling pig.) 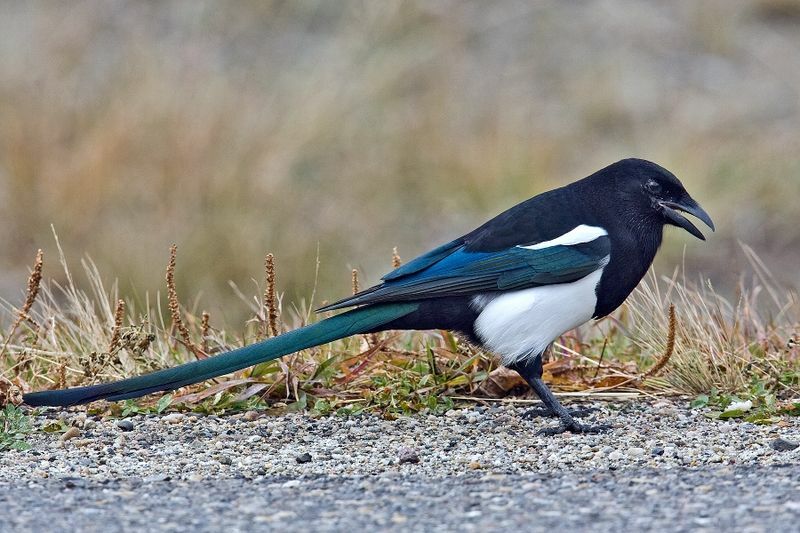 Magpies also forage for ticks and other parasites from the backs of ungulates. Like their other corvid cousins, they follow wolves to gain access to game carcasses. In some cultures magpies are revered as bringers of good fortune. Or they’re tricksters. Or shape-shifters. They’re sacred to Dionysus. They are fearless. Mysterious (a secret never to be told). And in this country, they are abundant! ~ by theresakishkan on October 26, 2014. This entry was posted on October 26, 2014 at 11:25 pm and is filed under Uncategorized.You can follow any responses to this entry through the RSS 2.0 feed.You can leave a response, or trackback from your own site.